Canadian online roulette players are generally spoilt for choice when it comes to deciding between deposit methods to fund their online casino account. While the most popular methods involve using cards or e-wallets to make a real cash deposit for roulette, Entropay is the third way. Relatively new to the world of online roulette, Entropay is a virtual credit card, and it often displays the Visa logo required by some online casinos or general e-commerce sites. It is a prepaid card, and its simplicity is one of the main positives, which makes it so popular with players across Canada. How do you deposit with Entropay? As Entropay is a prepaid card format, you will first need to register for a virtual card on the Entropay website load up your account from somewhere, usually a different credit or debit card or direct from your bank account. 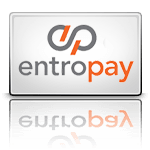 Then as soon as you want to start playing real money roulette, Entropay's logo should show up on the cashier or banking page of the casino. This allows you to click the logo on any roulette sites accepting Entropay, choose your deposit amount and enter your details to instantly credit your online casino account with real cash. Speed: Money hits your casino account instantly, so you don't have the hassle of waiting around before starting to play online roulette for real money. Freedom: Even if you have trouble being approved for a traditional Visa credit card, you can still register for an Entropay virtual Visa and use it at most if not all places that accept Visa payments. Privacy: When depositing with one of the many roulette casinos accepting Entropay, you can retain your privacy as you are not required to enter any additional personal details. This sets Entropay aside from certain other deposit methods. Acceptance: While not all credit cards can be used to make real cash deposits with Canadian-friendly online roulette sites, especially those issued by US banks, you will rarely if ever have the same holdbacks as far as Entropay is concerned. Among the great Canadian casino sites that offer online roulette, Entropay is a popular deposit method by virtue of the safety and security it provides for players. For starters you don't have to enter any additional personal details, unlike with certain other deposit methods. This can be important for those of us from Canada who are just starting out playing roulette for real money. First impressions are vital, and a banking method that keeps your personal information safe and secure is one of the best first impressions possible. We know as well as anyone else that you shouldn't underestimate the value of security. Because there are so many roulette sites accepting Entropay, you will need to find a way of determining which are worth your time before you settle down and make your first real money deposit for online roulette. Entropay is fantastic compared to some other deposit methods, but you should consider a number of other factors before deciding where to deposit your hard-earned dollars. We have a team of reviewers, all of whom are used to playing on the biggest and most reputable Canadian online casinos, as well as some smaller roulette casinos accepting Entropay which might still be great despite flying under the radar somewhat. Our reviewers have been on the lookout for crucial things like a wide range of roulette variants, games running at a variety of stakes, state of the art mobile, tablet and instant play software, and everything else that makes an online roulette site great. Entropay is one of the newest eCommerce additions, and perfect for Canadian players wishing to maintain autonomy. It is, in short, a virtual credit card, and often times appear to be a Visa. Because it is a prepaid card, it is a very simple solution for online real money Roulette players. It is an easy process: go to the Entropay website, establish an account, transfer money into your prepaid Entropay card from your chosen funding source, and go to a casino that accepts Entropay. It is that easy. We have located some great online casinos that accept Entropay. Absolutely! There are a few great online casinos that accept Entropay from Canadian online Roulette enthusiasts. When using Entropay prepaid Visa, you will be afforded, speed, privacy, flexibility, and, of course, casinos that cannot wait to accept your form of payment. Entropay is a very safe approach to online transactions. It uses 128-bit encryption that makes it impossible to be intercepted by hackers. They incorporate the same high tech firewalls that casinos and other major financial institutions use. In addition, they utilize military level security to protect all parties involved. Along with all the great security features, your personal banking information is never shared online with the casino. You maintain discretion and autonomy with both the casino and your bank. Instant funding means you waste no time. Just like a Visa is fast, so is Entropay virtual Visa. You can load your online casino bankroll and get right down to some real money winning fun. It is comparable when it comes to security and acceptance because of the Visa connection. However, what really makes Entropay a great method of deposit is its simplicity and speed. Yes, there are fees associated with your Entropay. After all, just like your Visa and MasterCard charge you interest, and charge merchants a fee, someone has to fund the service. In the case of Entropay, it is very affordable. Plus, it is free to open an account and create an Entropay Visa. There is a 4.95% fee to load an Entropay card from a personal credit or debit card. If you receive winnings from an online casino, there is a 1.95% fee. But in many cases the casino will eat this fee. There are a couple additional fees, but typically they do not apply to online casino players.